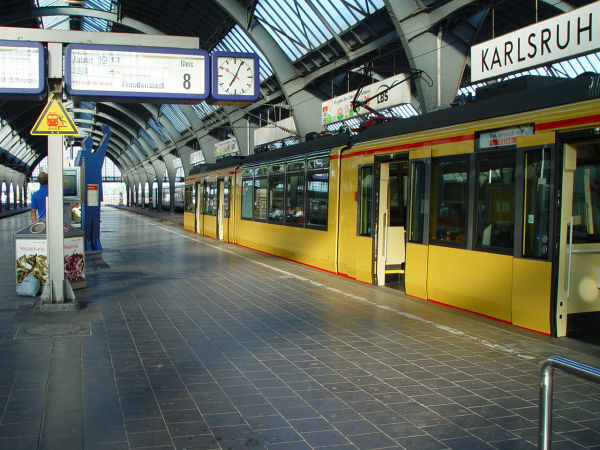 Karlsruhe in Germany was one of the first cities to introduce a so called tram-train lightrail service. Karlsruhe has a tram network, which has the same gauge width as normal trains (1435 mm). They built special trams, which can run on both trains' AC electricity as well as trams' DC electricity and which have the safety systems of both. In downtown they can run on the streets as trams and then they can run longer streches on train tracks. At Karlsruhe main station you can encounter these tram-trains both inside the station at the train platforms as well as outside by the tram platforms on the street. 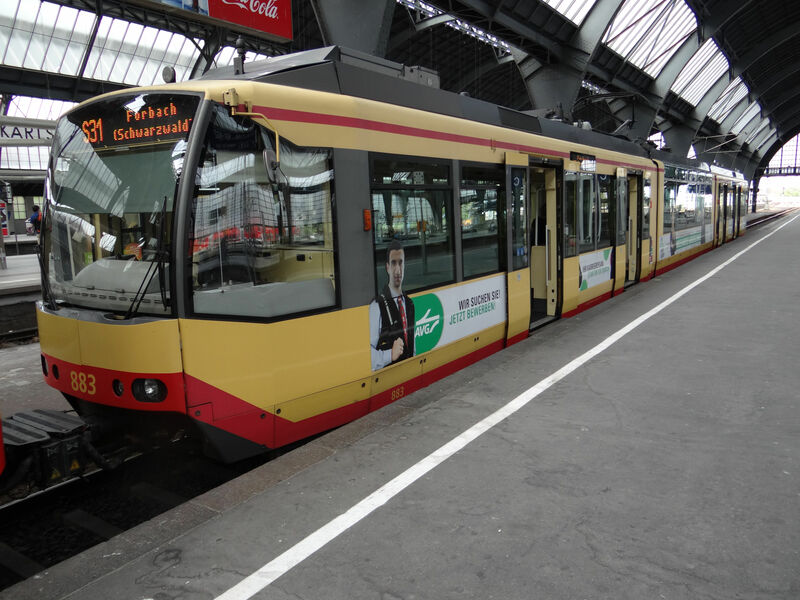 There are three operators of tram-trains in Karlsruhe, DB (four tram-trains) and AVG, Albtal-Verkehrs-Gesellschaft, a company owned by the city, as well as KVV, the Karlsruhe-Verkehrs-Vertriebe, the city tram service department. 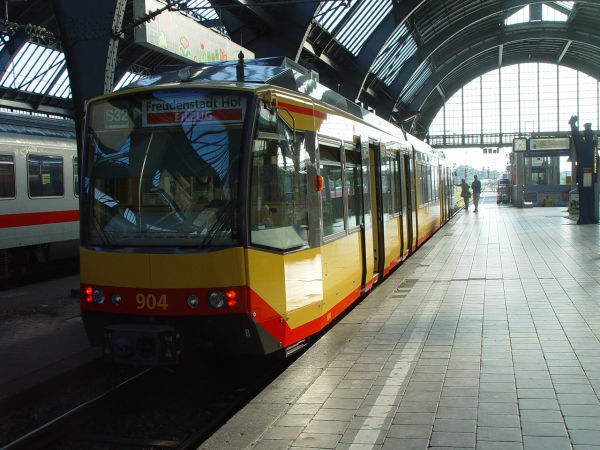 This is an AVG tram-train of the type GT8-100D/2S-M built 1997-2005 by Bombardier. 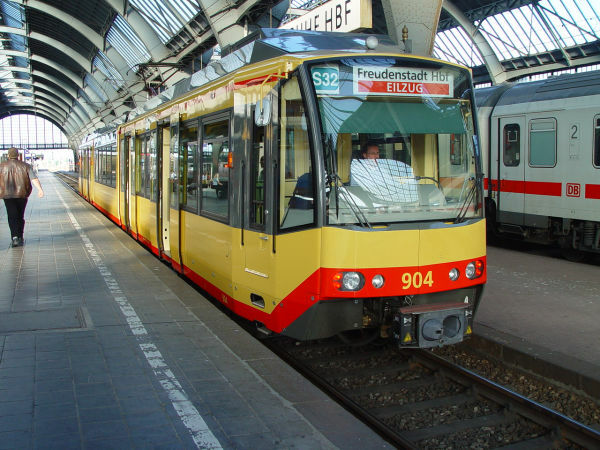 It is of the second generation of tram-trains in Karlsruhe. Picture at Karlsruhe Hauptbahnhof 20.7.2004 by Ilkka Siissalo. This is the same tram-train as above, but seen from the other end. They have similar driver's cabs at both ends to allow them to neatly turn around at small train stations far away from the city. Picture at Karlsruhe Hauptbahnhof 20.7.2004 by Ilkka Siissalo. 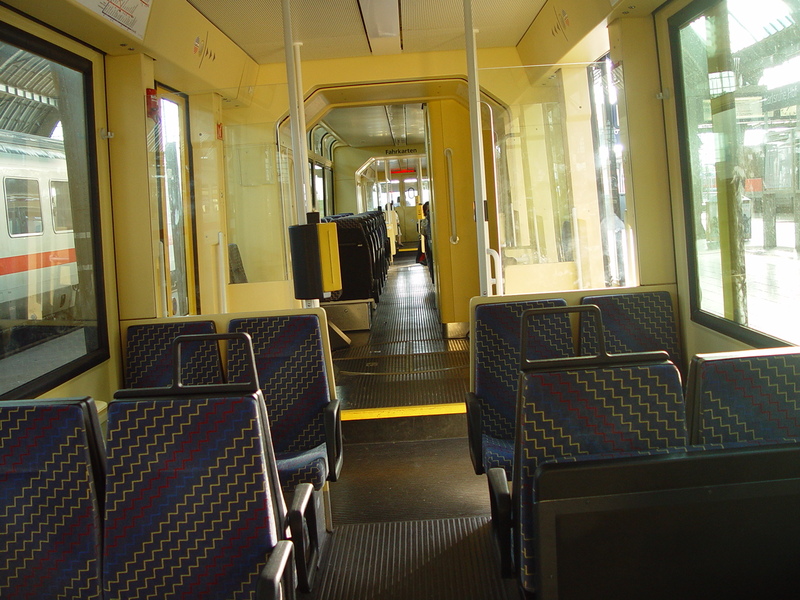 Side view of the same tram-train. Picture at Karlsruhe Hauptbahnhof 20.7.2004 by Ilkka Siissalo. Inside view of the same tram-train. Picture at Karlsruhe Hauptbahnhof 20.7.2004 by Ilkka Siissalo. A two units long tram-train of the S31 service. Picture at train platforms of Karlsruhe Hauptbahnhof 8.7.2015 by Ilkka Siissalo. AVG unit no.883. 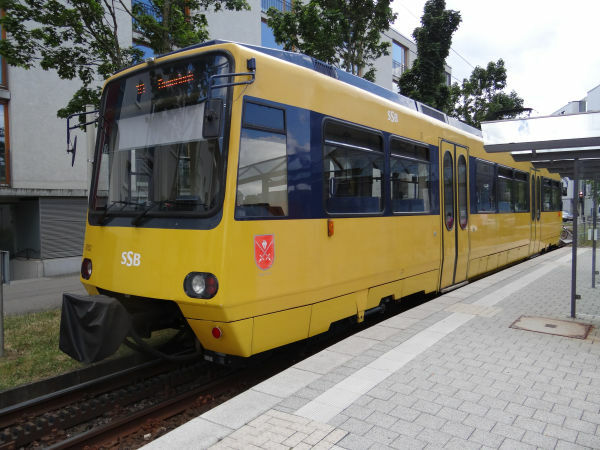 This was the second unit of the same tram-train as in the picture above. Picture at train platforms of Karlsruhe Hauptbahnhof 8.7.2015 by Ilkka Siissalo. This is a CityLink tram of the KVV, the Karlsruhe city tram company. 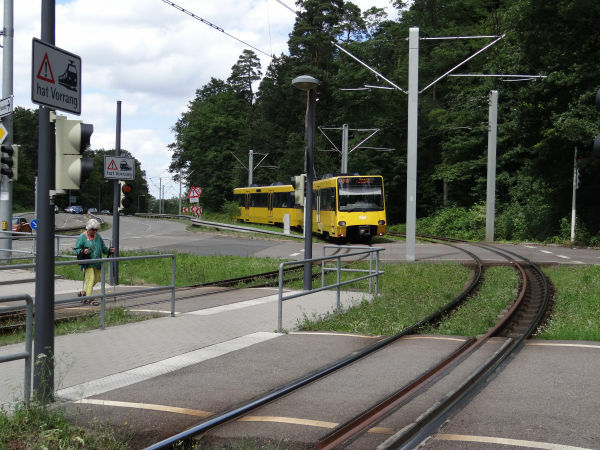 It is a NET 2012 type tram made by Vossloh in 2015 and it is also authorised to run on train tracks at the Albtalbahn, although here it is used as a normal tram. Picture at tram platforms of Karlsruhe Hauptbahnhof 8.7.2015 by Ilkka Siissalo. 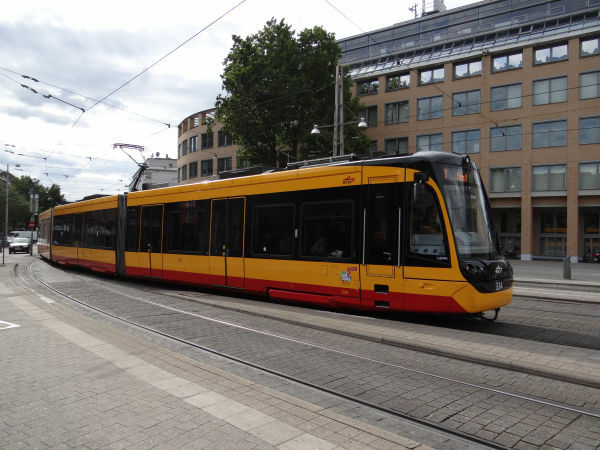 It's difficult to say if this is a tram or a train, but anyway it's for sure one of the most interesting German light rail systems. 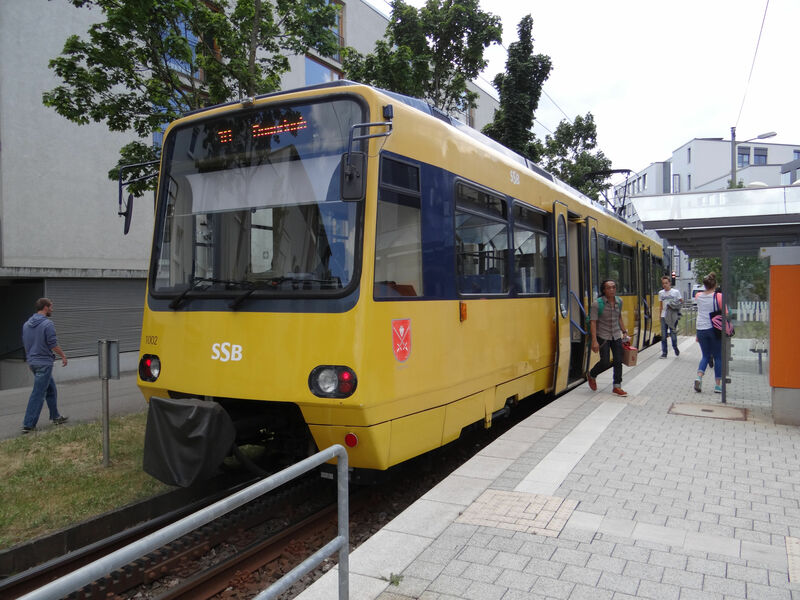 This is the line 10 of SSB, Stuttgarter Strassenbahnen AG, the city of Stuttgart tram company. 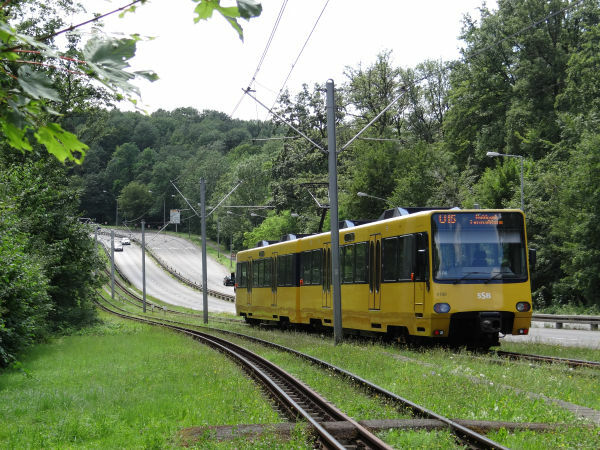 The line climbs very steeply uphill from Stuttgart city to Degerloch with the help of a cog wheel third rail system. The line was opened in 1884, first with cog wheel steam locomotives, which pushed three coaches up the hill. The present day four axle wagons came into service in 1984 at the centennial birthday of the line. Picture in Stuttgart 8.7.2015 by Ilkka Siissalo. Another picture of the SSB wagon 1002 on line 10. Picture in Stuttgart 8.7.2015 by Ilkka Siissalo. Same train as above. The actively tilting Br 611 is a typical product of the early 1990s. Picture in Ulm 13.9.2016 by Ilkka Siissalo. Yet a third picture of the same wagon. The rails are of metre gauge and the cog wheel racks are of the system Riggenbach. 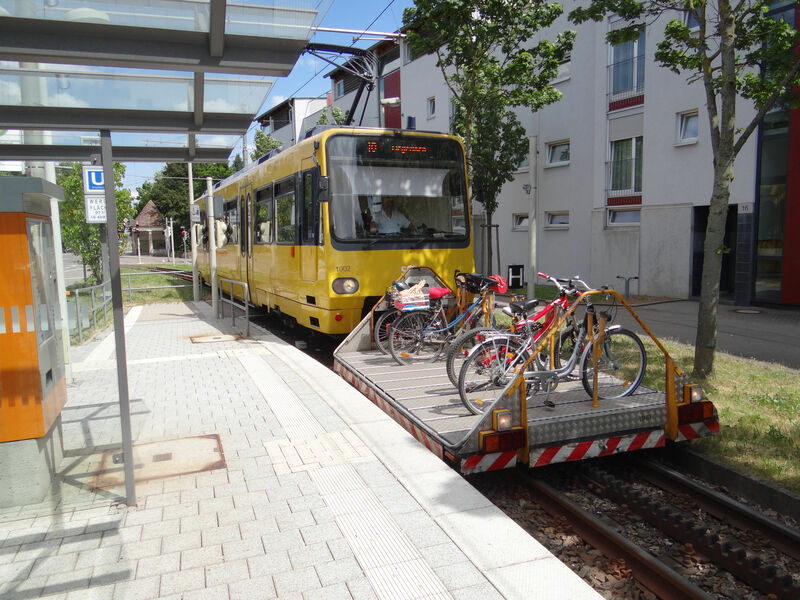 This is the only cog wheel rack rail system in metropolitan use in Germany. The maximum incline of the rail line is 17,5%. This rack rail train is a famous tourist attraction in Stuttgart. Picture in Stuttgart 8.7.2015 by Ilkka Siissalo. 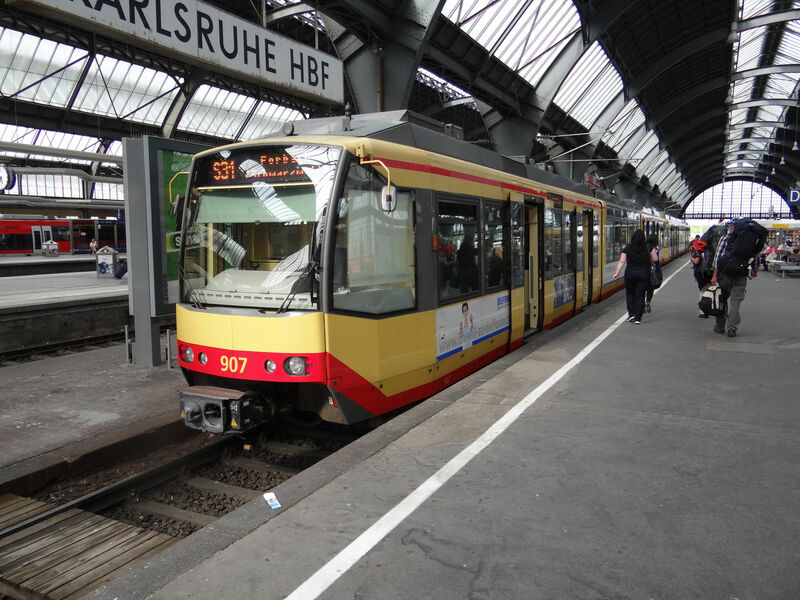 Stuttgart has also other interesting rail services. This is the line U15 service of the Stadtbahn light rail at the stop Stelle (Stelle = place in German, but yes, it is the name of the stop). Note the three rail system allowing also a narrow gauge train to run on the same track. Picture in Stuttgart Stelle 8.7.2015 by Ilkka Siissalo. A real kamikaze suicide candidate, this lady was actively trying to get run over by the Stuttgart U15 line light rail in spite of several warning signs, a blinking red light and an acoustic signal. She wasn't hit, but it was a narrow escape. Picture in Stuttgart Stelle 8.7.2015 by Ilkka Siissalo.